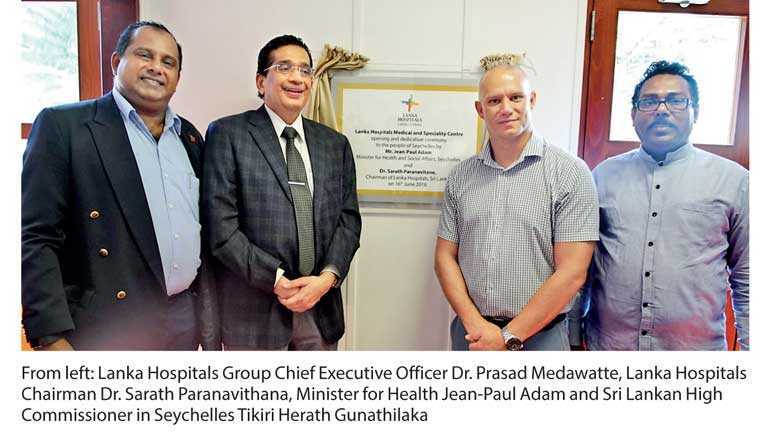 Lanka Hospitals PLC, internationally accredited healthcare provider offering world class tertiary medical care, recently announced the opening of a fully-fledged Medical and Specialty Centre in Victoria, Mahé Island in Seychelles. In a bid to expand its world class services across the seas, and being the only hospital in Sri Lanka which has been awarded the two most prestigious accreditations in the world- for its hospital service quality (Joint commission International (JCI) Accreditation and for its Laboratory service quality (College of American Pathologists (CAP) Accreditation), it has taken this initiative to provide top notch health experience to the people of Seychelles. Lanka Hospitals Chairman Dr. Sarath Paranavithana, Lanka Hospitals Group Chief Executive Officer Dr. Prasad Medawatte, Sri Lankan High Commissioner in Seychelles Tikiri Herath Gunathilaka, Secretary of State for Foreign Affairs Mac Suzie Mondon, Minister for Health Jean-Paul Adam, Ambassador Barry Faure, Health Care Agency Chief Executive Officer Dr. Danny Louange, Business Consultant Vipul Knumale and Lanka Hospitals PLC Head of Operations Dr. Sanjeewa Ranbadu. Liaising with Lanka Hospitals International Patient Care Centre in Colombo, the Medical and Speciality Centre in Victoria offers specialist consultations such as cardiology, paediatrics, orthopaedics, and rheumatology and oncology in addition to conducting various tests including health screening and ECG. The centre further provides laboratory and pharmaceutical services, telemedicine and e-consultation as well as fertility and maternity advisory services. The Medical Centre in Seychelles also serves as a pivotal hub that provides referrals to Lanka Hospitals, especially when patients in Seychelles are required to undergo further medical procedures, in addition to performing follow ups on treatment and consultations. Established in 2013, the International Patient Care Centre at Lanka Hospitals has played a crucial role by offering personalised and superior medical facilities for international patients. Adopting a holistic approach to care for the wellbeing of individual patients, the centre offers a wide gamut of services for patients with 24-hour emergency, OPD, lab and pharmacy services in addition to airport pickup, accommodation and medical support during air transfers. Since its successful entry into Seychelles, Lanka Hospitals has provided its services to over 10,000 patients (in-patients and out-patients) during the last five years. The newly-established Medical and Specialty Centre will further help Lanka Hospitals to expand its outreach throughout Seychelles and its neighbouring regions, creating provision for more patients to seek world class medical care.